These are the small rectangle size flavor strips that go inside the hollow clear plastic buttons so you know which flavor of soda you will get when you press that button. Magnum size is about the size of the side of a pkg of cigarettes. this is the most common size used by Dixe Narco, Vendo, Royal and others during the 2000's and some before. 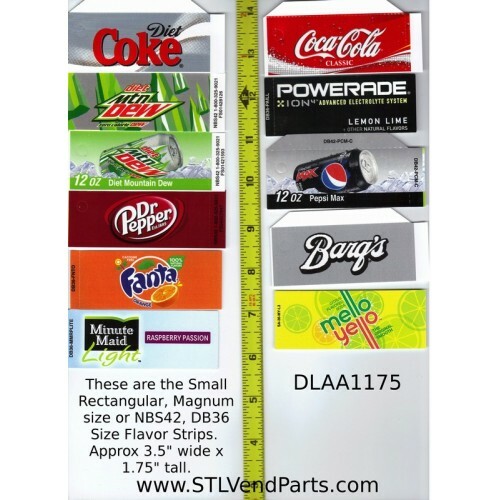 DURING CHECK OUT in the notes, or in an email to Sales@STLVendingParts.com Please specify what flavors you want, and if you want them to be CAN or BOTTLE most are no longer allowed to be printed in LOGO due to Obamacare calorie requirements... Some of them can also be pulled up individually on here and ordered by entering DLAA1175 in the search window. These are the most common size of Flavor Strips in use today. They are often refered to as the Magnum size. 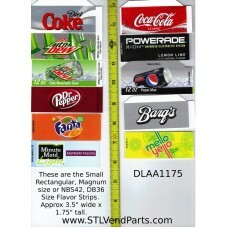 This is the industry standard size label for the smaller rectangular buttons that are in used in 80% of the current soda vending machines. They have removable tabs on one side or the other and many have removeable tabs across the top as well, allowing for use in any of the hollow buttons, where they slide in from the rear. They also have the removable punch out for the sodl out light, if you machine is so equiped. If you are placing these in a button that seems backwards to your tab layout, simply remove the tabs on your strip, and then put a piece of scotch tape on the end you need the tab to be on. Fold the tape over on it's self to make your own tab. At the top here you can go to the Labels, Cards and Stickers Section then Choose Flavor Strips and you will be able to choose your size and the Exact strip you are looking for. Additional ones are available, jsut ask.